I had a lovely day of hanging out with my lifetime best friend and being crafty. BEADS EVERYWHERE!!! i actually didn’t spill them for once! weird. i did however remind myself why i rarely will make jewelry using thread with beads instead of wire. ITS A PAIN! and it takes forever! i did make a really pretty necklace tho. id post a pic, but i forgot to take one. it may find its way to etsy someday… if i ever get around to actually putting that store together…. someday i’ll use that account. otherwise, a fairly uneventful day. i really enjoyed it. i thought about my blog today… perhaps some more background is appropriate…. considering i have little to say about today. i am currently planning a major road trip… this being said, i’ve already driven from west virgina to idaho since october. stopping at home in ohio and then working for a month in montana. so since the end of october, i have traveled more that 3000 miles. i’m planning on adding another like 7000miles by march. yeah…. my car, i bought last november with 80,000 miles, it is currently at approximately 98,700 miles. oh and i spent over a month in puerto rico last year, as well as just not really driving for 2 months. yeah, my dog and i, we get around a bit. you would think that after all this, saying, “lets go for a ride” would make her run the other way… but every time, she gets all excited and starts jumping around, and when you open the car door, you can’t keep her out. Shelby is an excellent road trip dog! my friend has this theory, that dogs stick their heads out car windows in order to get high. the reasoning being that dogs have incredible senses of smell, and getting that much stimulation, that fast much be overwhelming to the senses… affecting a dog the way drugs affect people. i’m not sure about it, my pup looks pretty lucid here… but then i cant resist asking her if she wants to get high now when i open the window for her… im pretty sure she now knows this means the window is going down…. Road tripping with my dog, always looking for new adventures! Not much of a conversationalist, however, she lets me know she’s there for me. we did have an amazing mini road trip that day anyway, southern Montana is gorgeous! 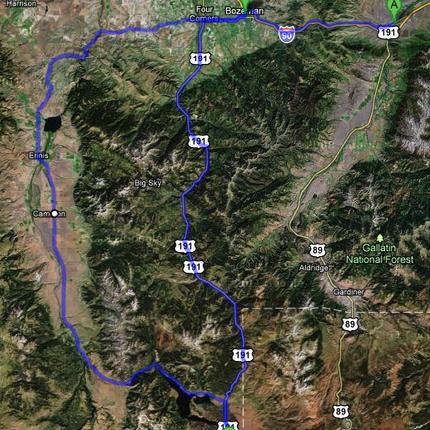 our mini road trip route that day… not so mini… about 300 miles i think. but absolutely beautiful! yes there are pics… but so many, it’s gonna take awhile for me to get them up…. they’ll be included in the vicariously thru me and/or the drive by shooting albums later. I believe the biggest downside to my traveling buddy being a dog, she gets to sleep through all of the flat states…. following river season… it takes a while for my voice to come back. it aint pretty. in fact sometimes she sings along. Absolutely aiming to be in the SLC viscinity for new years eve to visit my sister and a bunch of other awesome people for a few days on a hoity tioty type mountain where i’m going to have to get on skis for the first time in over a decade… i’m sure that will be fun to watch! yes i will post pics! after Utah, i’m heading east a lilbit to Colorado to bounce around the state and visit some of my favorite snow bums and hopefully do some snowboarding with most of them! After that I’m headed to LA to visit more lovely people who i haven’t seen in nigh forever… then picking up a good buddy and heading east. IF i can afford it, i’d absolutely love to add Boston into the mix as well as visiting the other half of my brain, and soon to be best selling fantasy author (her first novel to be published later this month) in Canada before heading home to hang with the fam and work for my dad for a few weeks before heading back to the Cheat Canyon in mid to late march. i googled the loop, starting with home, entering all of the specific stops i’d like to make, including the maybes (tahoe, boston, cananda) and it comes to approx 10,166 miles. roughly 8.5 days of driving alone. yeah, i think i this may fulfill my goal of big roadtrip… might even satiate the wanderlust for a bit…. maybe… i did afterall get invited to go to Africa for next winter… SO MANY POSSIBILITIES!!! inicidentally… in case you’re wondering how i can possibly afford this…. technically, i cant. but as long as my dog’s fed and my car insurance is paid, i’m not gonna worry about that. let this be a lesson to you, saty in school… but if you dont… drop out early so you don’t have a ton of debt! ha! yes, i am aware that im not necessarily a good influence on young people… but you could do worse too. alright, on that note… i’m going to bed. happy adventures! I love that first pic. She looks so happy to be riding along with you. That is quite a bit of traveling. You’re right you could do worse. I think it would actually be worse to have one steady job one hates, in a place one doesn’t like to be than to not have a set job but get to travel.